On the cover of BAR, January/February 2016: William Jessup University student Jessica Rentz proudly presents a Persian/Hellenistic-period figurine head of a male priest excavated at Tell Halif in the 2015 dig season. Photo: Cynthia Shafer-Elliott, Ph.D.
Why do hundreds of volunteers from around the world travel to Israel and Jordan to take part in archaeological expeditions each summer? For many, it’s because these digs offer a portal to the Biblical world. Excavations across the Biblical lands transport volunteers back to a time when kings and queens reigned, a tribal social organization defined daily life, and trade networks stretched from the Arabian peninsula to the islands of the Aegean. Stepping out of the portal and plopped into a trench, dig volunteers may unearth the common objects signaling everyday life: jugs, lamps, loom weights and perhaps—if they’re lucky—coins. Stepping back and gazing at the excavation site as a whole, the volunteers may imagine from humble archaeological remains what once stood here proudly: a palace, a temple, a marketplace—perhaps all encircled by a massive fortification wall. So grab your passport and come along with BAR as we visit four representative sites that will open a portal to the storied world of the Bible and our ancient past. “It was fantastic being in a multi-disciplinary and multi-cultural environment and working with a variety of ages, from three-year-old children to eighty-year-old experienced archaeologists,” said Tell es-Safi volunteer Seng Tawng of Lutheran Theological Seminary in Hong Kong, pictured here with Carl Schwanke, a retired chemical engineer, excavating Iron Age vessels from the ninth-century B.C.E. destruction layer at Biblical Gath. Photo: Aren Maeir. Last summer, the excavation team uncovered the Iron Age city gate and fortifications of Philistine Gath. That field season marked the third time retired chemical engineer Carl Schwanke had returned with his wife, Leslie, to Tell es-Safi. Excavating in the lower city of Gath, the Schwankes and their team members uncovered clear evidence of iron production in layers dating to about 800 B.C.E. Tel Aviv University’s Lyndelle Webster and the Austrian Archaeological Institute’s Lisa Peloschek unearth the outer wall of a metallurgical installation on “Slaves’ Hill,” an extensive, Solomonic-era copper production site in the center of the Timna Valley in southern Israel. Photo: Central Timna Valley Project. The University of Edinburgh’s Claire MacKay smooches an Iron Age I dog skull at Abel Beth Maacah. Photo: Abel Beth Maacah Archaeological Project. Peeling back layers of history, Schwanke and his team members found remnants of an Iron Age metallurgical production area: slag (stony waste produced after smelting), hammerscale (flaky remains from the iron forging process) and tuyere fragments (a nozzle through which air is blasted into a furnace). “We are still searching for remnants of an actual furnace—or furnaces—used in the production to quantify its importance to the city,” Schwanke explained. At the summit of Tell es-Safi, the Gath volunteers were excavating a collapsed floor dating to the Early Bronze Age—a time before the arrival of the Philistines. Wesleyan University’s Sarah McCully uses a trowel while Stanford University’s Simeon Ehrlich uses a patiche to carefully excavate Philistine storage jars caught in Ashkelon’s destruction by Babylonian King Nebuchadnezzar in 604 B.C.E. Photo: Melissa Aja, courtesy of the Leon Levy Expedition to Ashkelon. “We excavated the continuation of the Early Bronze fortification wall and even seem to have found an area that archaeologists F.J. Bliss and R.A.S. Macalister previously excavated [at the end of the 19th century],” marveled Bar-Ilan University freshman Shoshana Guterman. Moving from the southern coastal plain north to the lush Jezreel Valley, we arrive at Jezreel, where Naboth the Jezreelite and King Ahab of Samaria argued over Naboth’s vineyard (1 Kings 21:1–4) and where Queen Jezebel was trampled to death by usurper Jehu’s horses (2 Kings 9:30–33). The Jezreel Expedition has been excavating at the site since 2013, uncovering remains spanning the Neolithic, Chalcolithic, Early Bronze, Middle Bronze, Iron Age, Roman, Medieval and Islamic periods.b The project is led by Jennie Ebeling, Associate Professor of Archaeology at the University of Evansville, and Norma Franklin, Research Associate at the Zinman Institute of Archaeology at the University of Haifa. Turning a laborious task into fun in the sun, volunteers and staff at the ancient harbor town of Tel Dor form a bucket chain to transport dig fill away from the excavation squares. Photo: Lara Brucker/Tel Dor. Kyung-Chul Park of Hanshin University in South Korea discovers an Iron II zoomorphic figurine at Tel Burna, believed to be Biblical Libnah. Photo: The Tel Burna Archaeological Project. According to Elizabeth Kunz, a senior at the University of Evansville, volunteers must be able to endure physical labor in the blistering Mediterranean heat. Total stations, like this one used by University of Evansville students Elizabeth Kunz and Emily Corrigan, record elevations and were just one of the technical tools used during the 2015 season of the Jezreel Expedition. Photo: Courtesy of the Jezreel Expedition. Kunz recommends staying well-nourished and hydrated throughout the dig day. At the ancient seaport of Ashkelon, Ethan Lunow of Wheaton College uncovers an overturned marble capital. Photo: Melissa Aja, courtesy of the Leon Levy Expedition to Ashkelon. The Jezreel Valley is also where the Legio VI Ferrata, or the Sixth Ironclad Legion, was camped. The Legio VI Ferrata was one of two Roman legions, along with the Legio X Fretensis, stationed in Judea during the reign of Roman emperor Hadrian (117–138 C.E.). The camp of the Legio VI Ferrata was known previously only from historical sources. In recent years, remains of the legion’s base have come to light through archaeological work led by Matthew J. Adams, the Dorot Director of the W.F. Albright Institute for Archaeological Research in Jerusalem,c Yotam Tepper, a Ph.D. candidate at Tel Aviv University, and Jonathan David, Professor of Classics at Gettysburg College. University of California, Berkeley student Melissa Cradic shows a bichrome jug that had been discovered in a burial at Tel Megiddo. Cradic also excavates at Legio, a Roman camp just south of Tel Megiddo. Photo: Eric H. Cline. William Jessup University’s Aurora Eagan presents the bottom fragment of a Persian/Hellenistic figurine depicting two sets of legs at Tell Halif. Photo: Cynthia Shafer-Elliott, Ph.D.
For Mattingly, excavating under the scorching sun pushed her and her team members to their physical limits, but also unified them as a group and as part of a greater educational objective. Mattingly added that having a sense of humor is a must. At Bethsaida, the search for small finds continued with sifting by Kate Phillips, a participant with Consortium Member, University of San Diego. Photo: Hanan Shafir. “Bethsaida is the only place associated with Jesus’ ministry in Galilee that is available to archaeological research. All other places—Capernaum, Chorazin and Nazareth—were severely destroyed in later periods,” said Arav. Tel Dor staff members Yiftah Shalev, Hagar Ben-Basat and Amit Rosenblum hold up a partially reconstructed Iron Age Phoenician pithos. Photo: Howard Karesh/Tel Dor. Part of the excitement of archaeology, according to Creighton University senior Tom Ferlic, is being able to see what may not have been seen for millennia. For excavation volunteer Caitlin Doherty, a recent graduate of the University of San Diego, working in a fill at Bethsaida offered her a chance to dig up a vast expanse of the site’s history all at once. McCormick Theological Seminary’s Hyunju Lee unearths a second-century B.C.E. lamp at Khirbet el-Eika overlooking the Galilee. Photo: Tal Rogovski. While immersed in the Biblical past, our dig volunteers found themselves forming wonderful friendships that unified the group and helped make the demanding work even fun. And for volunteers both seasoned and brand-new, having history be so tangible was an unforgettable experience. “It was fantastic being in a multi-disciplinary and multi-cultural environment and working with a variety of ages, from three-year-old children to eighty-year-old experienced archaeologists,” recalled Tell es-Safi volunteer Seng Tawng, a doctoral student at Lutheran Theological Seminary in Hong Kong. 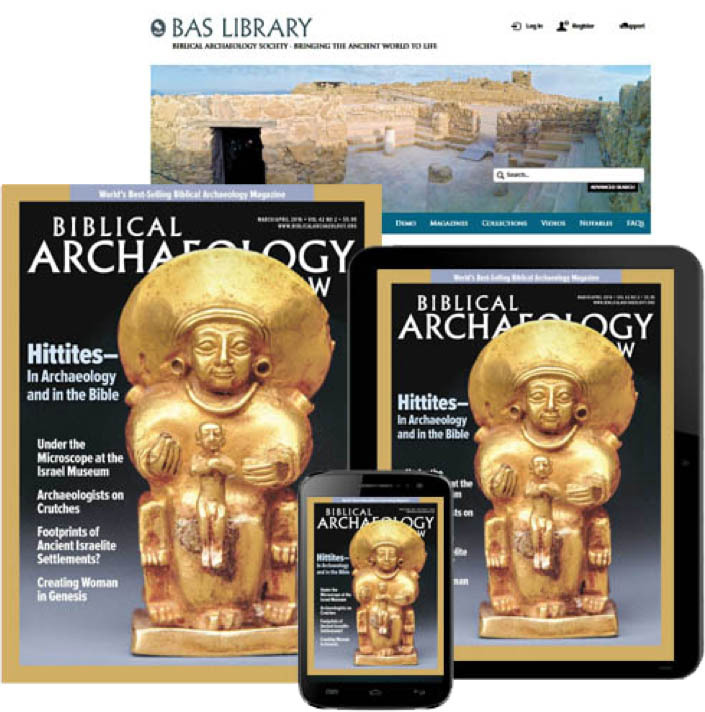 “Digs 2016: Passport to the Biblical World” by Robin Ngo originally appeared in Biblical Archaeology Review, January/February 2016.
a. See Aren M. Maeir and Carl S. Ehrlich, “Excavating Philistine Gath: Have We Found Goliath’s Hometown?” BAR, November/December 2001; Aren M. Maeir, “Prize Find: Horned Altar from Tell es-Safi Hints at Philistine Origins,” BAR, January/February 2012.
b. See Norma Franklin and Jennie Ebeling, “Archaeological Views: Returning to Jezreel,” BAR, May/June 2013.
c. See Matthew J. Adams, “Archaeological Views: On the Shoulders of Giants: Directing Jerusalem’s Albright Institute,” BAR, November/December 2014.
d. See Matthew J. Adams, Jonathan David and Yotam Tepper, “Legio: Excavations at the Camp of the Roman Sixth Ferrata Legion in Israel,” Bible History Daily (blog), October 20, 2013 (www.biblicalarchaeology.org/legio). e. See Rami Arav, Richard A. Freund and John F. Shroder, Jr., “Bethsaida Rediscovered,” BAR, January/February 2000.